Although the markets are closed Monday in observance of Presidents Day, the rest of the week packs a powerful punch of economic data on manufacturing, housing, wholesale and consumer inflation. In manufacturing, the Empire State Index will be released Tuesday followed by the Philadelphia Fed Index on Thursday. In housing news, the Housing Market Index will be released on Tuesday with Housing Starts and Building Permits coming on Wednesday. Wholesale inflation from the Producer Price Index will be delivered Wednesday, while the Consumer Price Index will be released on Friday. Meeting minutes from the Federal Open Market Committee will be released Wednesday. 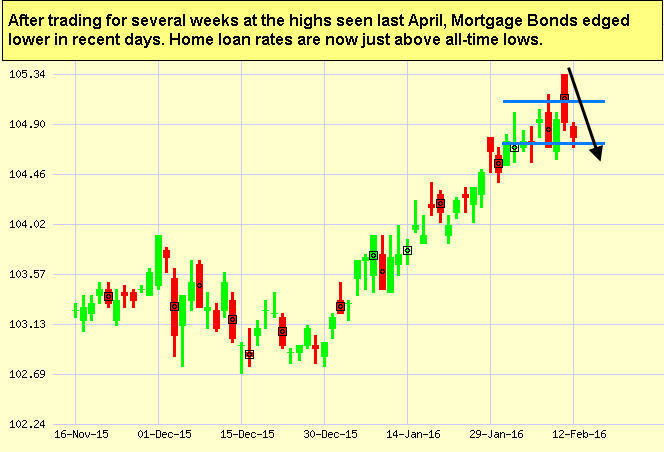 As you can see in the chart below, Mortgage Bonds have slipped slightly but home loan rates still remain near historic lows. As talk-radio for the digital age, podcasts deliver fresh ideas for just about any area of interest, and many are hosted by the brightest minds in their fields. The business podcasts below are no exception, and might be just what you need for your next business breakthrough. TEDTalks Business is a collection of favorite TED and TEDx conferences, bringing you insights and inspiration from top innovators, educators, scientists and researchers around the world. HBR IdeaCast is a feature of Harvard Business Review, offering analysis, advice and business research insights from one of the nation’s top management schools. Office Hours is hosted by New York Times best-selling author Daniel H. Pink, whose interview roster reads like a Who’s Who of business, including Biz Stone, Malcolm Gladwell, Tom Peters, Harvey Mackay and many others. Seth Godin’s Startup School guides salespeople, entrepreneurs and managers through building and running their dream business. Godin covers everything from analyzing your competition, to winning advertising, to cash flow management and more. Inc. Uncensored is hosted by Editor Jim Ledbetter. Each week you’ll get powerful ideas and advice about selling, entrepreneurship, new technology and innovations to help your business grow. Keep your audio downloads organized with a podcast manager app like Overcast for Apple devices or Player FM for Android devices. And if you just can’t get enough, here are 95 more podcasts to inspire and propel you to success.